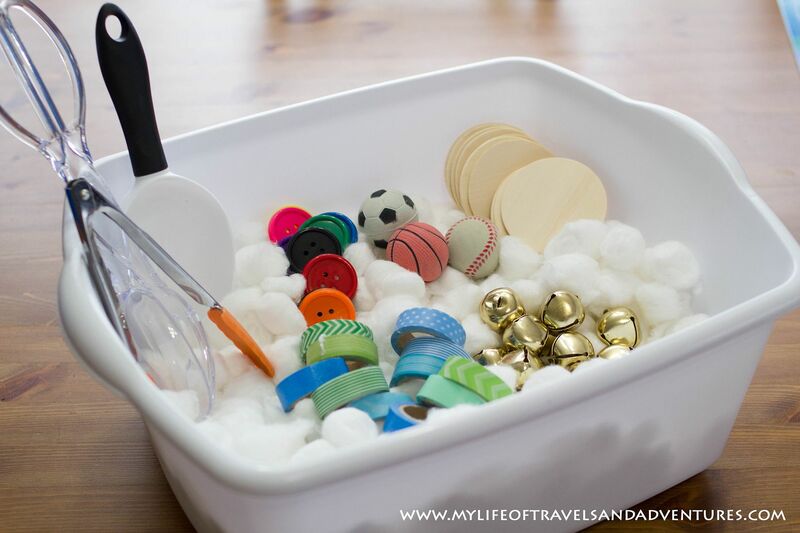 Supplies: Washi Tape, Large Dish Pan, Large Buttons, Cotton Balls, Large Bells, Wooden Circles, Balls, Scoops and Tongs. 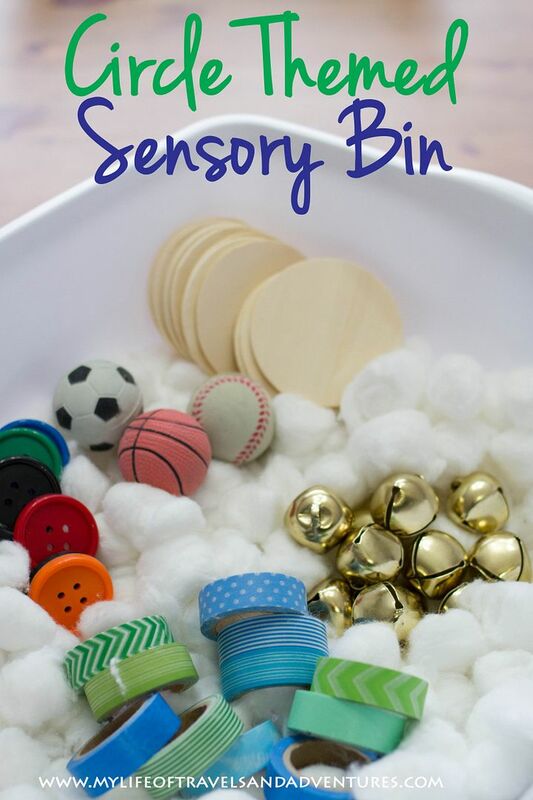 This sensory bin was hard for me to come up with. I just could not find any round items to put in it. 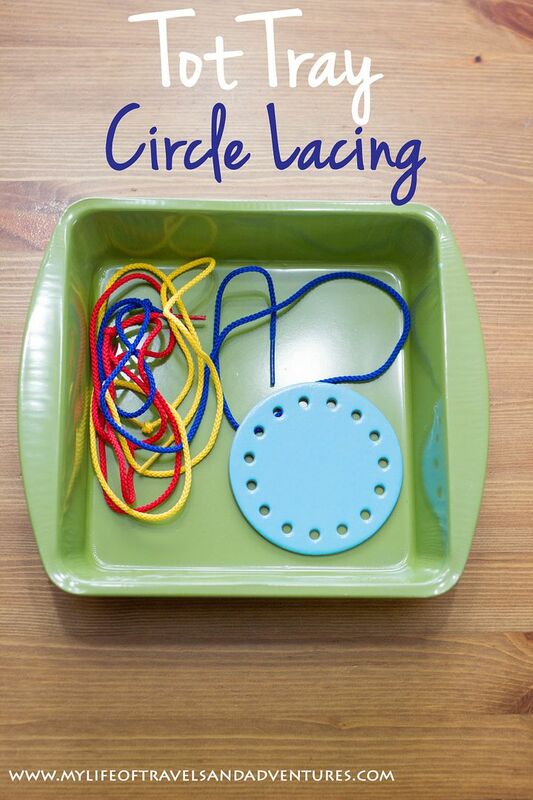 Once I moved on to circles & balls, it was much easier. 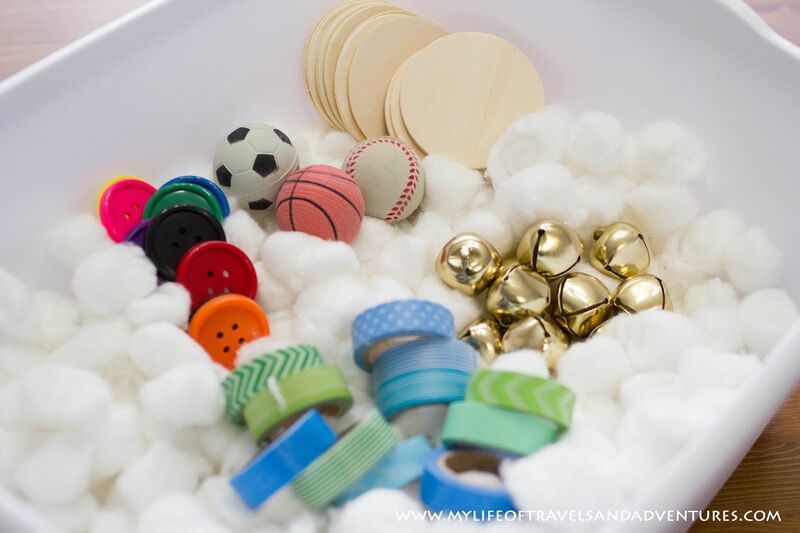 The hit of this sensory bin is definitely the three balls. All I have been hearing all week is "sock-a ball, base-eh-ball and base-ka-ball". 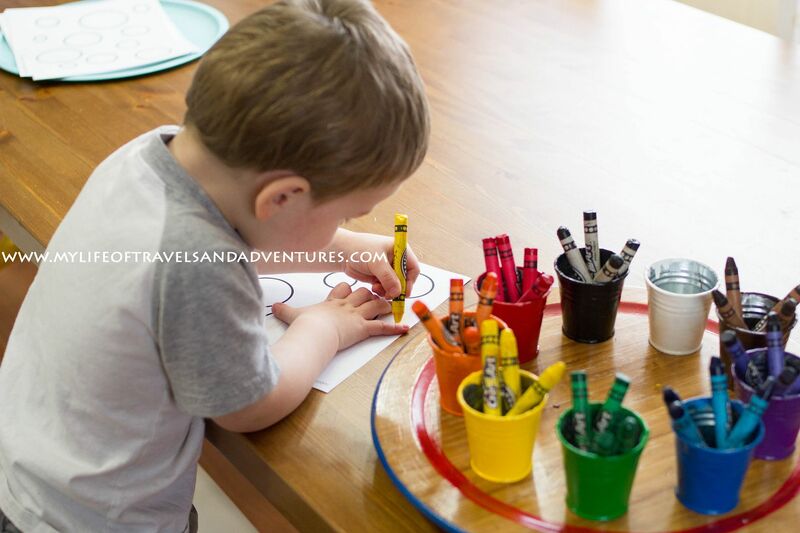 Reid loves playing with the dot markers. Loves. 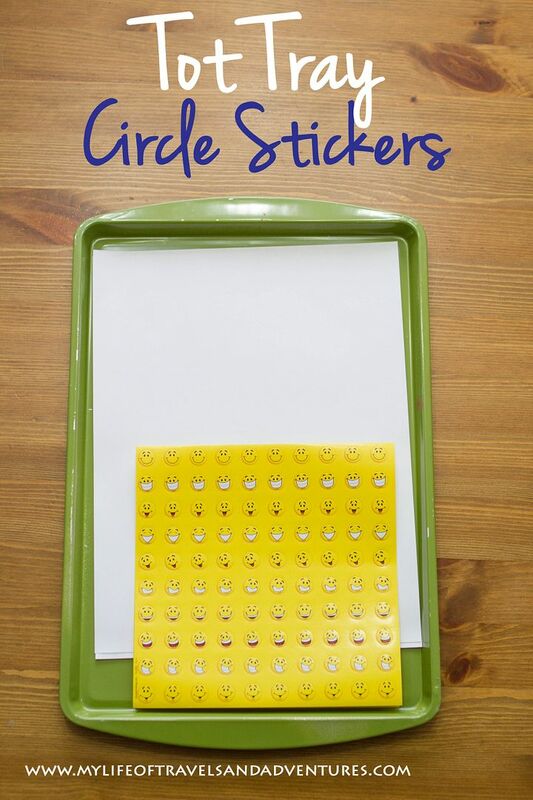 This week's circle printable was a hit as well. Flash cards are hit and miss around here. Maybe 5-10 minutes a day are spent playing with them. I usually say what is on the flashcard, hand it to Reid and he either stacks or makes a line out of them. Reid likes using tongs. So moving the pompoms from hole to hole was quite fun for him. Again with the glue stick. A hit. Reid filled a couple sheets of paper with these goggly eyes. 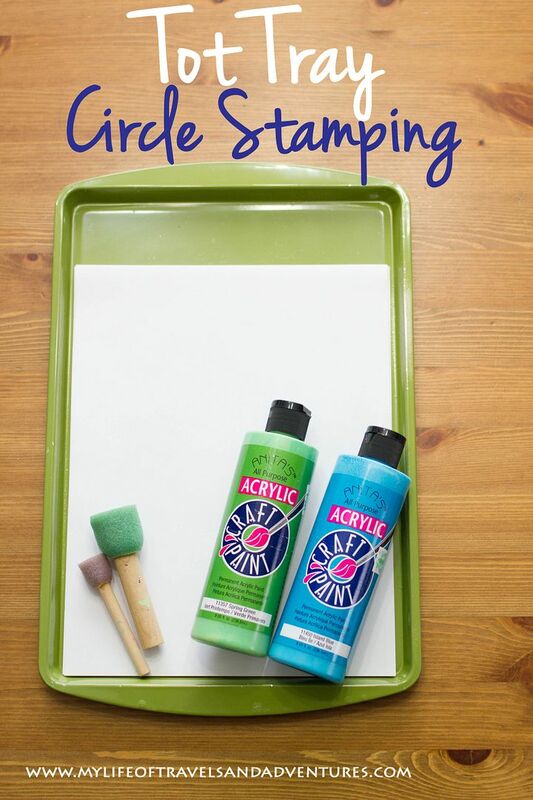 When I showed Reid how to dab the foam brushes into the paint and then stamp with them, I said "Dab, dab, dab... Stamp, stamp, stamp." All week when we came back to this activity, it was "dab, dab, dab, stamp, stamp, stamp" coming out of his mouth. Another simple activity... I set Reid up with this while I was making dinner the one night. Peel & stick. This was a quick activity for Reid... he lost interest pretty fast. We are definitely in a puzzle phase around here. All day. Every day. 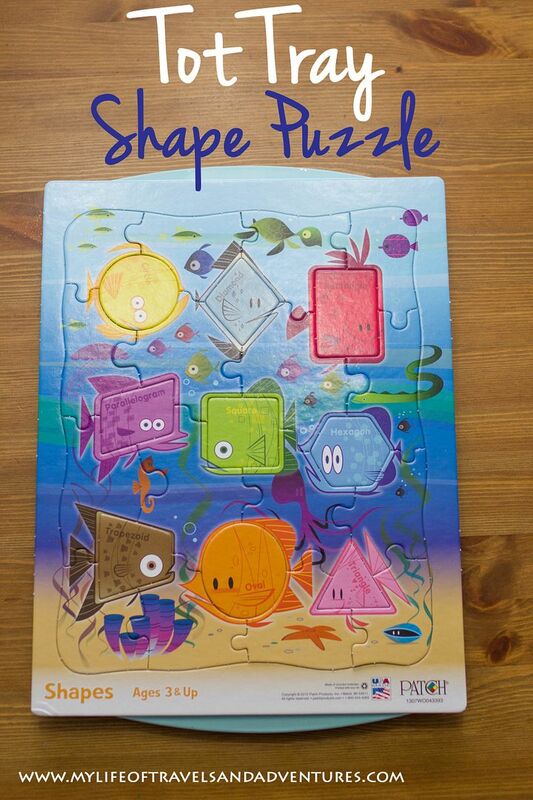 I bought this puzzle in a pack of 3 for his Easter Basket this year. 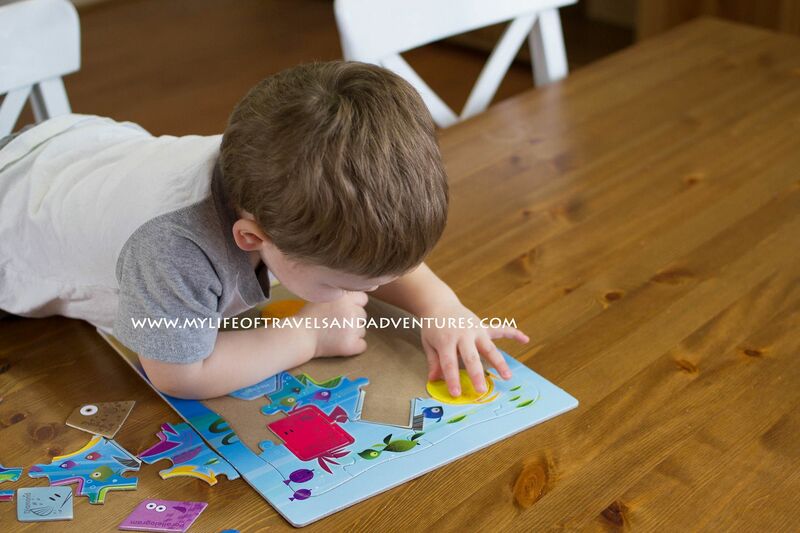 But when I saw how easy his other puzzles have been for him, I thought maybe. He took right to it but does need a little help here and there. 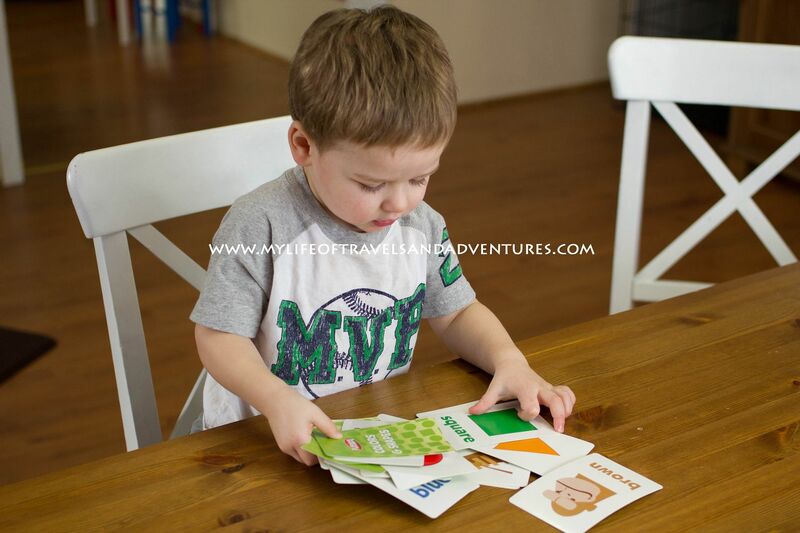 I used a couple different printables from Moms Have Questions Too this week. Coloring is always fun. This circle came in a pack of different shapes (like last week's heart). These are pretty hit and miss around here. I absolutely love all of your ideas. I'm going to try them out soon. Bingo dabbers would be awesome for my boys, I had never thought of it. 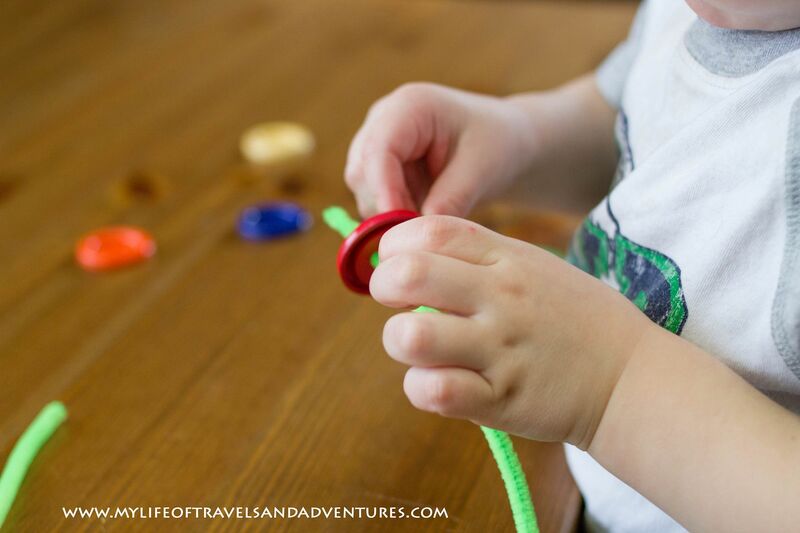 Thanks for sharing on Artsy Play Wednesday. Pinned to our group board. 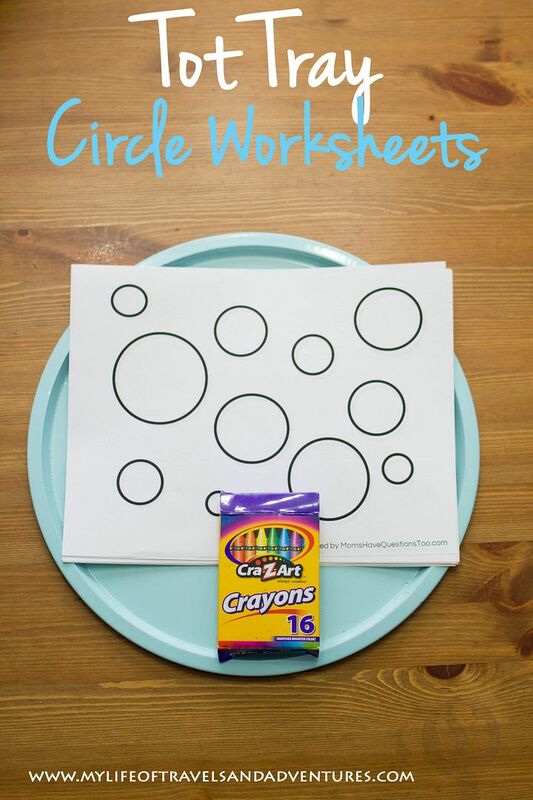 Those are wonderful ideas for learning about circles! 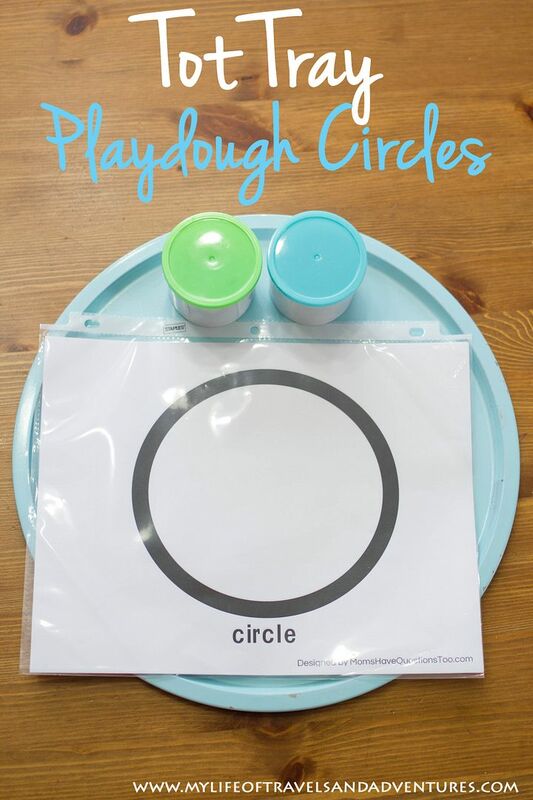 I especially love the idea of using playdough around a printout of a circle. 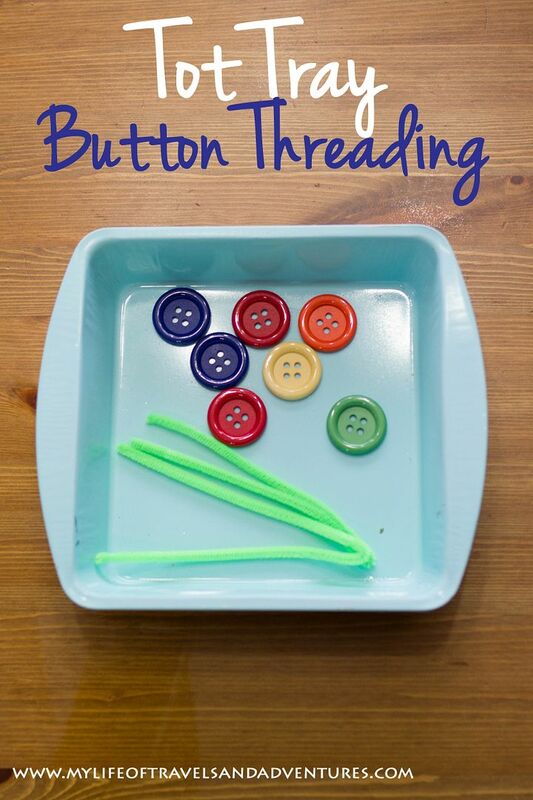 I imagine you could also use a coffee lid and play dough to make circles. Thank you! 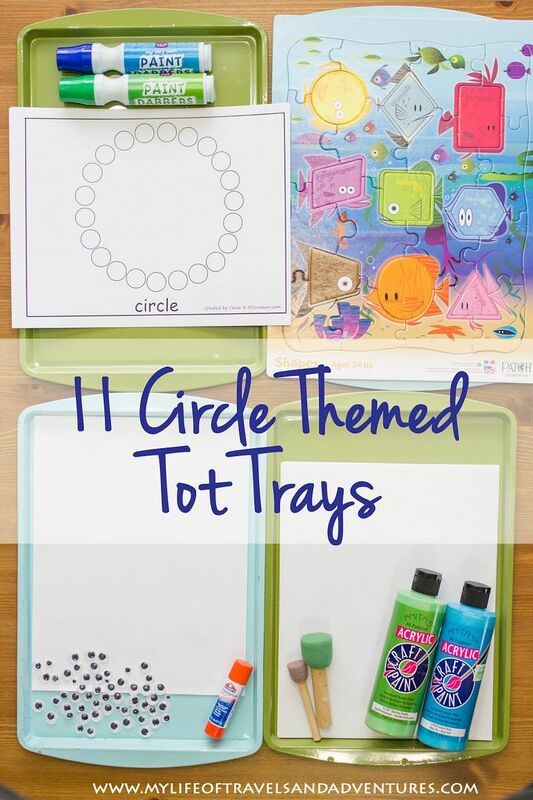 I really love your circle trays! 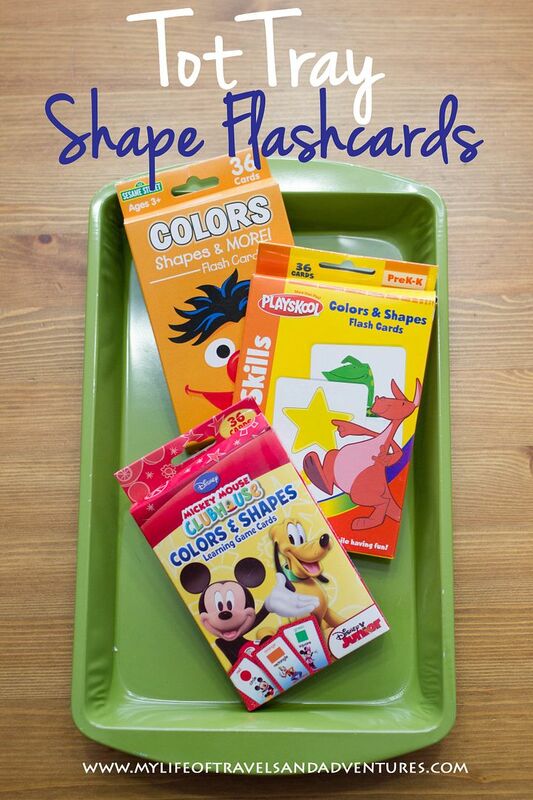 I am fixing to move on to some shape trays as a side work in tot school. and I love all these ideas! 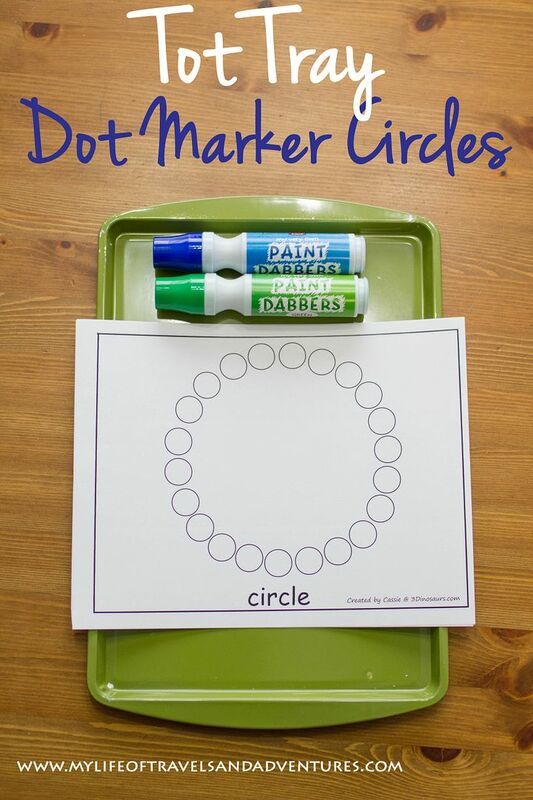 I'm glad to see that someone other than me uses the shape dot marker printables! Love this! 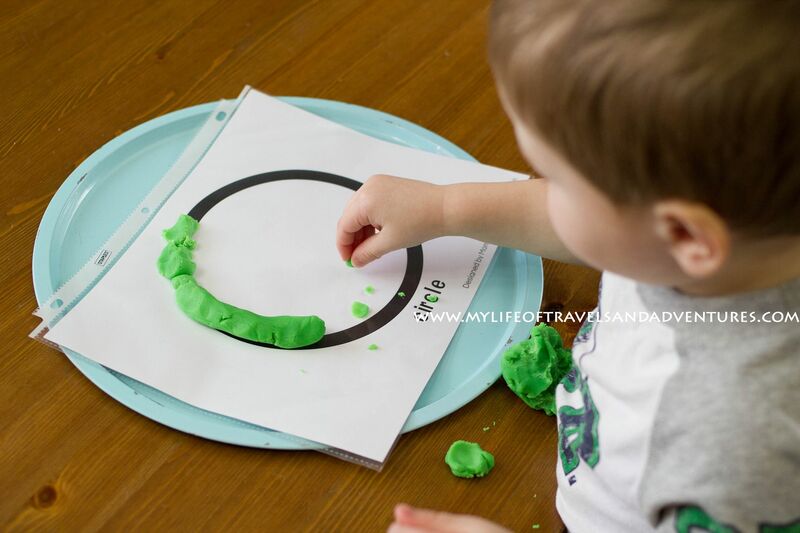 What great ideas and great variety of objects that are circles. Thanks for the inspiration! Love this!! 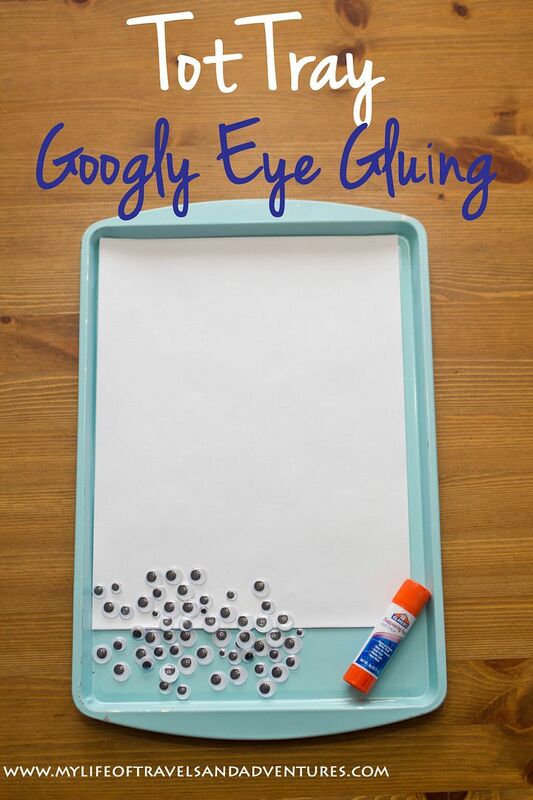 What a great idea with the googly eyes. Such fun stuff. I featured you at Meaningful Mama (Mom's Library) today. I hope you'll come on over, grab a button and link up again. Thanks so much for sharing your great content. I LOVE this post! I bet your little one had a blast going through all the trays. So many ideas! Thanks for sharing. Oh and P.S. 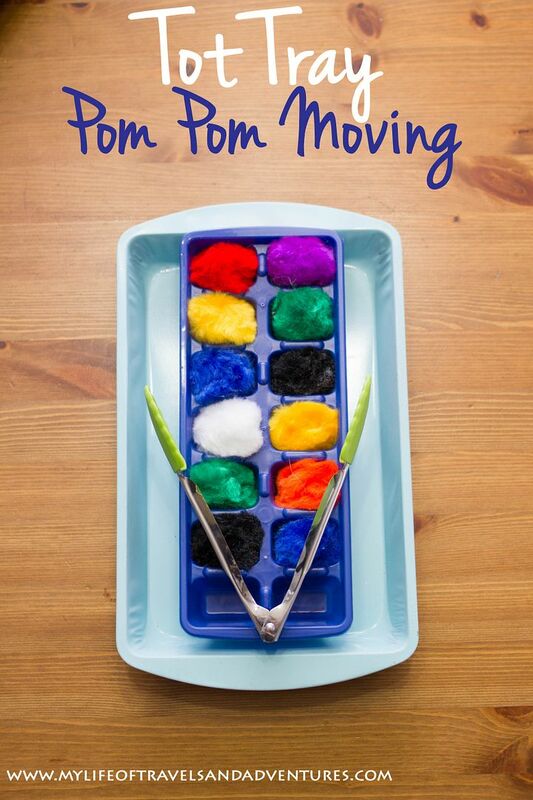 Love these colorful tins for color sorted crayons. Simply brilliant!